Solar power is becoming more popular across California. The renewable energy source is consistently proving to add value to homes, save people money on utility bills, and help the environment, which are all great reasons to invest in your own solar system. However, if you’re currently shopping for a home, you may come across some options that already have solar panels installed. 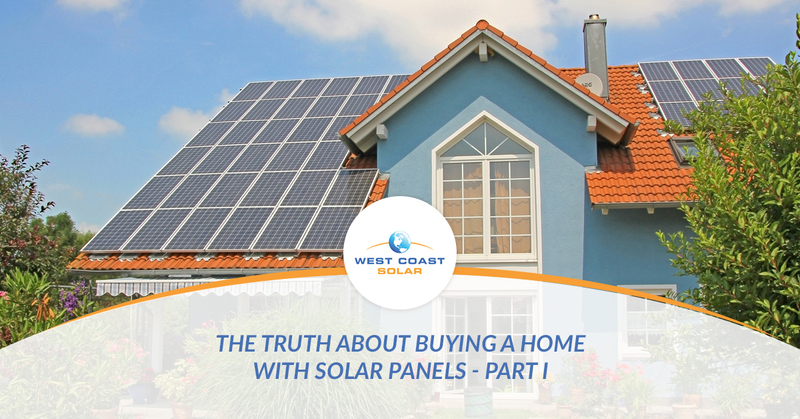 West Coast Solar wants to share how to approach purchasing a home with a solar system already installed so you can make the best decision possible. Buying a new home is an exhilarating experience. It’s one of the biggest purchases you will probably make in your life. As you shop for the perfect home, we encourage you to look for listings with solar systems already installed. You won’t have to install the solar system on your own dime, and you will be able to reap the benefits of renewable energy the first day you’re living in your new home. It’s a win-win situation for you and the home seller. If you can find your ideal home with fully-paid solar panels, you will be buying the system with the house without any strings attached. This means the seller owns the solar panels, and you won’t have to work with a lease, loan, or community program to acquire and use the solar system. This is the best-case scenario for anyone looking to purchase a home with solar panels already installed. A solar panel system that is leased means the current homeowner sends payments to a solar company to use the panels and produce energy for the home. If you’re going to purchase a home with leased solar panels, you will want to review the lease term agreements, monthly payments, lease length, and cost inflation. How does the lease agreement affect the use of the panels? What is the lease term length? Have the monthly payments inflated since installation? Is the solar system lease included in the home price? What happens if I do not want the solar panels? Finally, you will want to review your current financial budget to determine if you can afford to take on another monthly payment to keep the solar system on the home. Taking on a solar system lease can raise your debt-to-income ratio, which could make it more difficult to acquire a home mortgage. You may want to also consider requesting how the solar system fits into the overall price of the home. In most cases, a leased solar system will be included in the home price. West Coast Solar Keeps Solar Simple! In part two of this blog series, we’ll discuss the other two solar panel scenarios and offer more benefits to using renewable energy to power your life. West Coast Solar has been serving Sacramento, San Jose, and the greater Bay Area for more than a decade. We want you to benefit from the use of green energy. Call us today to get started on your solar system design!